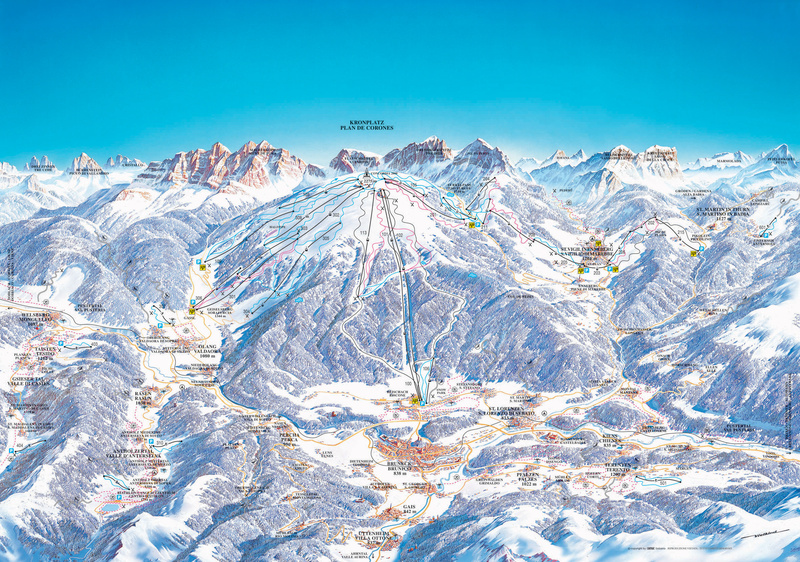 One of the best ski resorts in the Alto Adige - northern region of Trentino region. Ski resort Plan de Corones is situated on the slopes of a rounded peak above the town of Brunico. From his links to all the world perfectly prepared slopes of all difficulty. Distance from Innsbruck is about 100 km south. Hotel Petrus is located in the center Kronplatz, 3km from Brunico center with shops, bars, restaurants and railway, airport 100km. The recently partly renovated hotel Krondlhof is quietly located in Riscone (Reischach), about 1.5 km from Brunico (Bruneck). Shops, bars and restaurants around 1.5 km. Bus stop 150m away. Pleasant Rosen residence is located in Riscone, about 4km from Brunico in the popular ski resort Plan de Corones. Hotel Tannenhof is located at the foot of the Plan Corones in Riscione, 1.5 km from Brunico to shops, restaurants, bars and rail. Airport 100km. The apartments and residences are located in the town Riscone (900 m). Hotel Mühlgarten is located in the center of the Riscone Stefansdorf near the quieter village, about 100m from the shops and restaurants. Brunico center about 3km. Popular Rautal Garni Residence is located in a quiet, sunny spot in San Vigilio Marebbe, convenient location within the ski area Plan de Corones. The village center only 300 meters. This family hotel grant for a quiet panoramic position about 600 meters from the center of San Vigilio di Marebbe popular resort Plan de Corones. Apartment house - Residence Clara is situated in panoramic location in the heart of St. Vigilio di Marebbe the lovely local farms. Ski slopes are just 200 meters from the residence. The apartments and residences are located in the town of San Vigilio di Marebbe (1,200 m). Comfortably furnished hotel Olympia is located at the foot of Kronplatz, about 1.5 km from the town of Brunico. The apartments are located in several small residences and apartment houses in the village of Brunico ski area Plan de Corones (Kronplatz). Royal Residence Hinterhuber is part of the hotel complex of 4 * Hotel Royal Hinterhuber, which is only 100m from it and guests can use the services of the hotel selected. Located in Brunico about 4km from the center. Residence Terento the quiet location yet close to town center Terento altitudes of 1210 in Alta Pusteria - South Tyrol. The Hotel Adler is located in the village of Rasun (Rasen) under Niederrasen, about 300 meters from the center with shops, bars and restaurants, 10 km from Brunico. The friendly, family-run hotel Brötz is located in sunny position with stunning views of the surrounding Alps, on the edge of the valley of Anterselva / Antholz in town Rasen / Rasun. Hotel Koflerhof is located in the village of Rasun (Rasen) at the beginning of the valley "Valle d'Anterselva". It is located in a quiet, sunny location (1.080mn.m. ), Amidst the nature park Ries-Aurina (Rieserferner-Ahrn), with stunning views of the surrounding Dolomites. Center with shops, restaurants and bars is 800 meters away. Apartment Olang Roulette located in different residences (Simon and Olang Kronplatz) in the popular ski area Plan de Corones (Kronplatz) near the village of Valdaora center, shops and restaurants (up to 400m). The apartments and residences are located in the town Valdaora (1,000 m). Hotel Oberleiter is located in Villa Ottone in the ski area Plan de Corones / Kronplatz, about 100m from shops and restaurants. Simple apartment accommodation economic category, Tantalus apartments, located in the town of St. Lorenzen / San Lorenzo di Sebato, asi2km from Brunico. Sporthotel Winkler is located in the quiet St. Lorenzen surrounded by greenery. Center about 3km, shops and restaurants about 1000 meters from the hotel. The cozy family-run Hotel Chalet Olympia is located in a beautiful location in the Valle di Casies (Gsiesertal) in the picturesque village of Tesido (Taisten) about 1.212mnm Centre with shops in the vicinity of the hotel (10m). Bus stop 15m, railway station Monguelfo (Welsberg) 1.5km, 1km pharmacy, hospital 10km. In the immediate vicinity (10km) is the Plan de Corones.